The Bicyclebungee’s light carbon-fibre unit is a spring-loaded bobbin for a bungee cord which attaches to the lead bicycle just below the saddle. With the lead bike aligned ahead of the other, the cord is extended and clipped to the handlebars of the following bicycle. As both cyclists head off in single file the leading rider will start to pedal more powerfully and the bungee cord will gradually extends out of its casing as it unwinds from the spool. As the ride progresses, the assistance-force from the front rider will accumulate in the retracting spring inside the bobbin and the bungee cord. This energy is then released as a smooth, steady pull on the following bicycle. Both riders can control their effort by selecting appropriate gears, with the towing rider choosing a lower gear than normal and the towed rider a higher gear than normal. If the difference between the riders is greater the bungee cord may reach a fully extended position. In this case, the assistance force is largely provided by the bungee cord. This force progressively increases the more the bungee cord is stretched. The distance between the bicycles depends entirely on how close the towed rider chooses to be. In short, the energy difference between the riders is absorbed by the Bicyclebungee and released to the back rider as a smooth assistance. 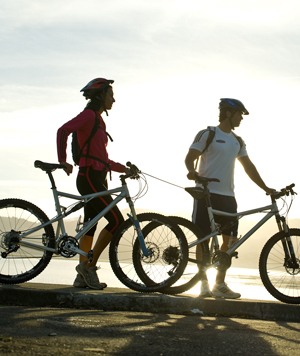 To disconnect the bikes the hook on the handlebars of the following bike can be quickly and easily released during the ride without stopping. The cord retracts immediately and completely into the Bicyclebungee housing. You can reconnect when stopped or when riding. Either rider can take hold of the hook and clip it onto the following bike’s handlebars again. 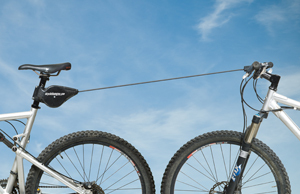 The key advantage of Bicyclebungee is that it provides the rear or slower rider with a better quality of ride. Using the gears, the riders can work at whatever effort level they choose as the gradual transfer of force continues to the bicycle being towed. The result is a smoother and more comfortable towing arrangement for both riders.